NEBOSH IGC qualification is a cornerstone for students wishing to have a successful career in occupational safety and health. NEBOSH International General Certification (IGC) is a prestigious qualification for aspiring safety professionals and also students wanting to have a strong footing in health and safety profession. NEBOSH is a global safety education body based in UK which offers various levels of safety courses through several affiliated study centres spread across nations. 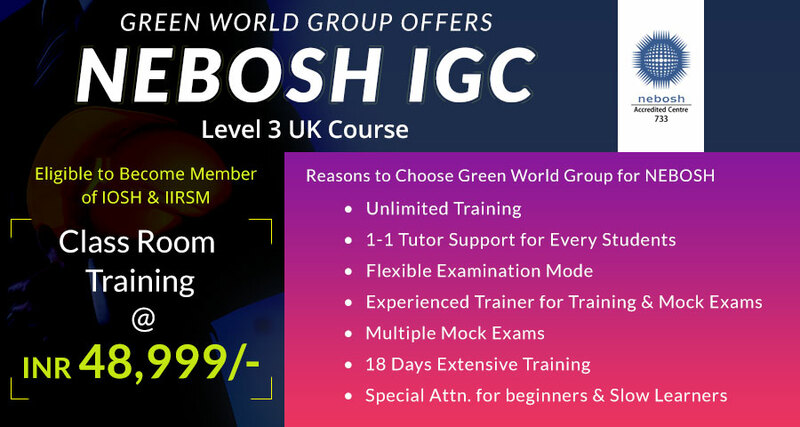 Green World Group is one such NEBOSH certified training centre in Kerala where students wanting to get NEBOSH IGC certification can join for quality training. NEBOSH IGC is the most-coveted qualification employers look for in the profiles of safety trainers and HSE managers. For NEBOSH IGC and other accredited safety course we hold the record of having highest pass percentage providing industries in and around Kerala highly skilled safety engineers and professionals. NEBOSH International General Certification in Kerala opens a gateway for students to pursue higher certifications in workplace safety and also seek professional memberships from some of the most prestigious institutions. For instance, students with NEBOSH IGC can aim for Associate membership from International Institute of Risk and Safety Management (AIIRSM) and Technician Membership (Tech IOSH) from Institution of Occupational Safety and Health (IOSH). NEBOSH in Kerala is ideal for both budding safety career seekers and also experienced safety professionals. Hence as far as qualification point of view, NEBOSH expects that candidates possess basic academic qualification with some knowledge on workplace safety and health. Learners of NEBOSH IGC in Kerala should have fundamental English language skills as all the lessons and practical assignments will be provided in English. Hence, students should be able to grasp the concepts correctly and reproduce the same in the exam to secure high marks. NEBOSH expects that students of IGC should understand the concepts thoroughly and the same will be tested in the final exam to issue certification. At Green World Group, over the years, we have grained expertise in providing high quality training to learners in Occupational Health, Safety and Environment. Students trained by us will have an edge over others when seeking occupations in industries as health and safety experts. Being the leader in providing NEBOSH and IOSH certified courses, we also have industry-specific and government-recognized safety diploma courses which students can join and complete at any time of the year. Our courses are designed by experts to meet the industry requirements. We provide training to students and employee representatives so that they could handle all kinds of workplace risks, dangers and hazards effectively. For NEBOSH and IOSH safety courses we are the undisputed leader having highest pass percentage. We have studied industries closely and have designed several recognized safety diploma courses to enable students have a wide range of career options. All our training centers are having well-equipped classrooms and trained faculty who are available anytime for students to clear doubts and enhance knowledge and working skills. Students can have an option of choosing classroom or e-learning/distance education learning option to suit their location, interest, time and professional and personal commitments. We have highly motivated student counselors who can provide tailor-made advice to candidates to choose the right course. Not only for budding safety enthusiasts, we also provide safety training for industries facing all sorts of safety challenges. Our onsite training modules facilitate workers gain knowledge and skills to tackle workplace safety and health issues. All our courses are well structured with excellent course materials prepared by safety experts. While offering high quality training, we have kept our course fees affordable for everyone. So, join us today to become a safety expert tomorrow. For Nebosh course fees in Kerala.. Enquire Now.